« I’m starting to read Stephen King’s The Stand…. First appearances of famous comic book heroes/villains are highly sought after in the comic book world. 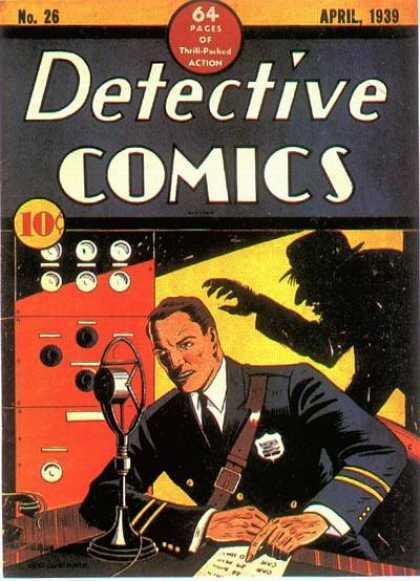 Who wouldn’t love an Action Comics #1 or a Detective Comics #27? But what about Action Comics #2? Or Detective Comics #26? Are anyone seeking these titles out? To me, it’s fascinating to look at very famous comic titles before or after they’ve debuted a very famous character. They may not look like even the same title. It’s weird to see an issue of Detective Comics with Slam Bradley or the Crimson Avenger on the front and not Batman. You feel like you’re in the Fringe universe. 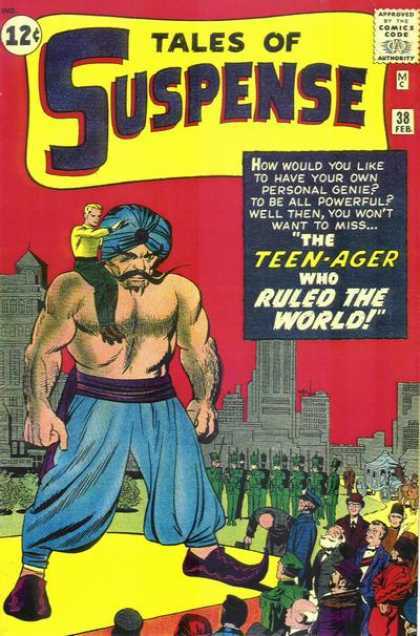 Let’s check out some of these fun comic covers and you can see how strange and foreign they look to you. 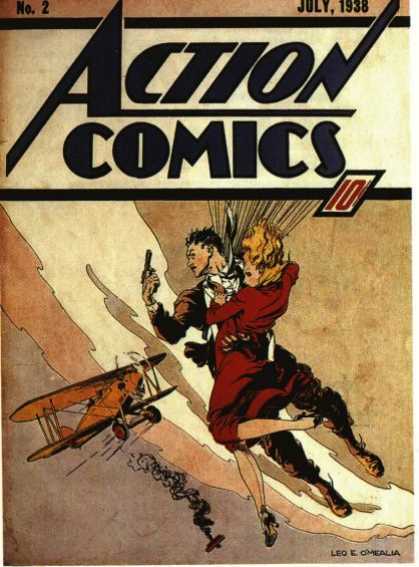 Action Comics #2 – Action Comics is probably one of the most iconic titles of all time. Who doesn’t know that Superman debuted in issue #1 of Action Comics (left) in 1938? Well, interestingly enough, Action Comics was originally meant to be an anthology adventure comic with several other adventure characters. So even though Action Comics is now strictly a Superman title, back then, Supes was just one of the featured characters. Therefore, issue #2 (right) didn’t feature Superman on the cover at all. Issue #3 didn’t feature Superman either. As a matter of fact, Superman wouldn’t make another Action Comics cover appearance until issue #7 (SIX MONTHS later). 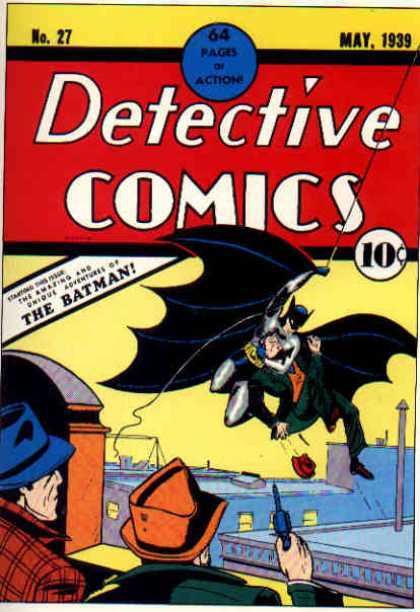 Detective Comics #26 and #28 – Detective Comics is as intimately associated with Batman as Action Comics is with Superman. However, Batman didn’t debut until issue #27 (middle), so there were 26 issues of Detective without Batman on the cover or in the book. 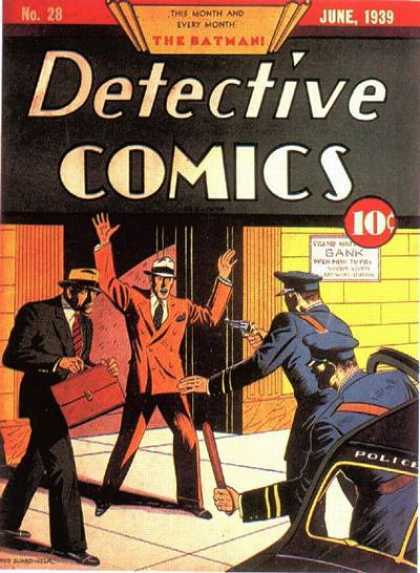 As you can see, in the issues before (#26, left) and after (#28, right) Batman you get standard covers of police officers and gangsters that you would normally appear on crime comics of this time. While Batman would return to the cover for issue #29, he would be absent again for issue #30. 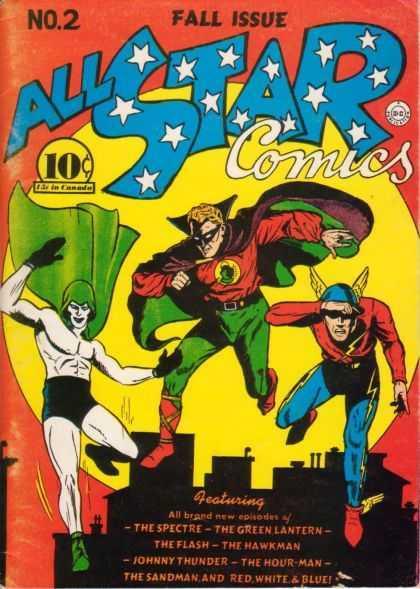 All-Star Comics #3 and #8 – All-Star Comics is a very famous Golden Age title. 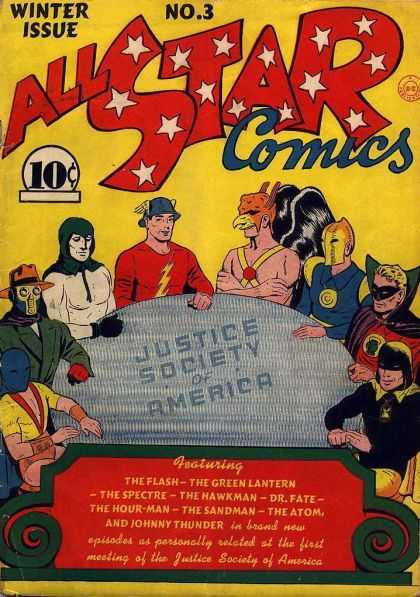 It features the first appearance of The Justice Society of America in issue #3 (middle) which is the first team-up of super-heroes into a single team in history. In issue #2 (left), you can see they still feature the heroes on the cover, but not collected together as one team as designated by issue #3’s giant round table with the team name embossed on the top. 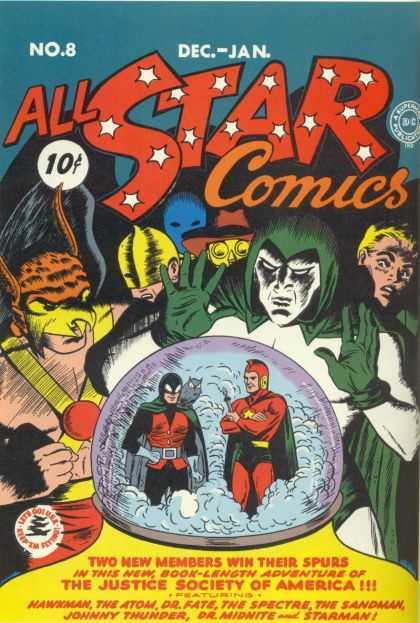 All-Star Comics #8 (right) is an interesting issue also. You wouldn’t know it by the cover, but that issue is the first appearance of Wonder Woman in an 8 page insert that was used to test the interest of Wonder Woman as a hero. Wonder Woman would join the Justice Society in issue #11…as their secretary (but she would make the cover!). She would prove popular enough to headline her own book, Sensation Comics, a year later. Showcase #3 and #5 – The debut of The Flash in Showcase #4 (middle) was one of the defining moments of the Silver Age. Showcase was a tryout book by DC to determine who would get their own series. As you can see, the issue before The Flash debuted (#4, middle) featured a story about deep sea divers called The Frogmen (#3, left). 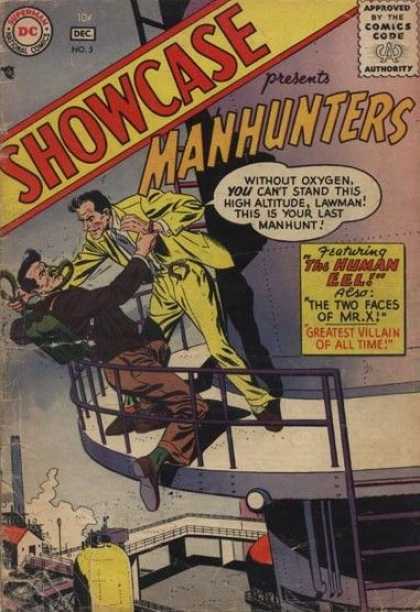 And even though The Flash was a huge hit, he wouldn’t appear in Showcase #5 which featured Manhunters (#5, right). 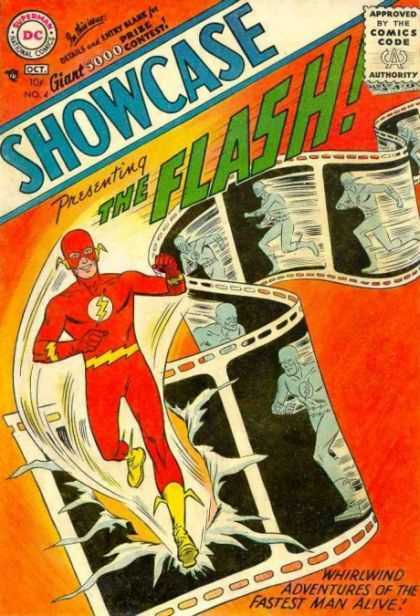 The Flash would reappear on the cover for Showcase #8. 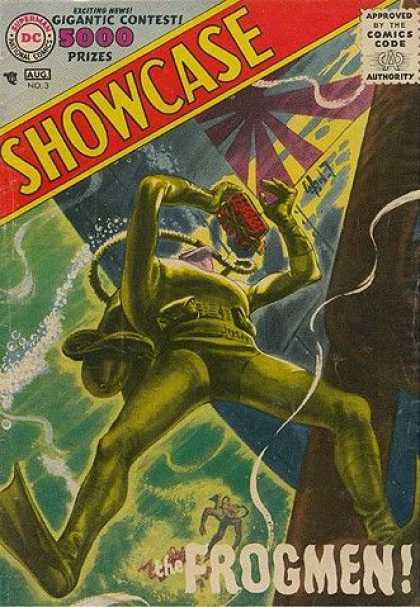 The Hal Jordan Green Lantern would debut in Showcase #22. 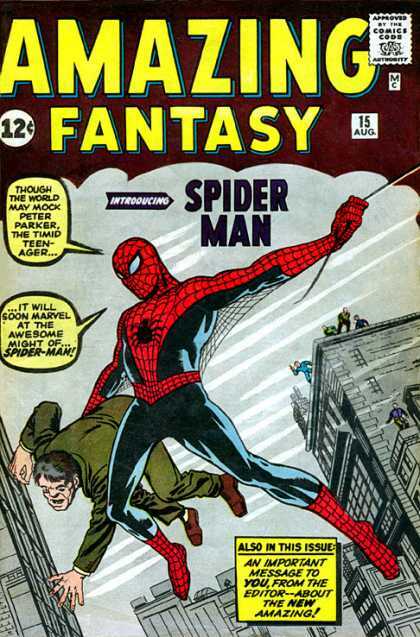 Amazing Adult Fantasy #14 – Spider-Man would debut in Amazing Fantasy #15 (right). However, not many people think about the previous 14 non-Spider-Man issues of that title. 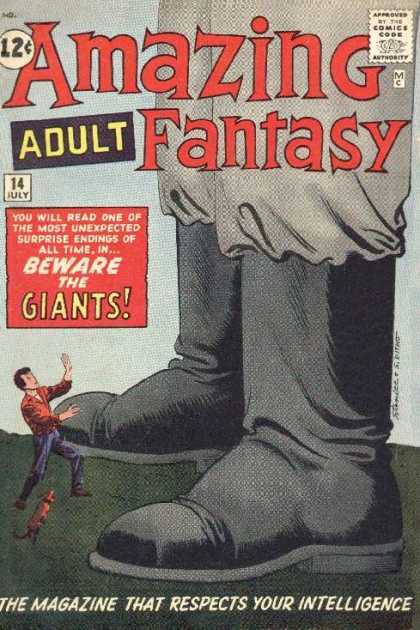 Amazing Fantasy was originally called Amazing Adult Fantasy and featured generic anthologies of suspense/adventure/fantasy stories. Issue #14 (left) is the issue right before Spider-Man debuted (right) and the title promptly ended so Marvel could print super hero comics full time. 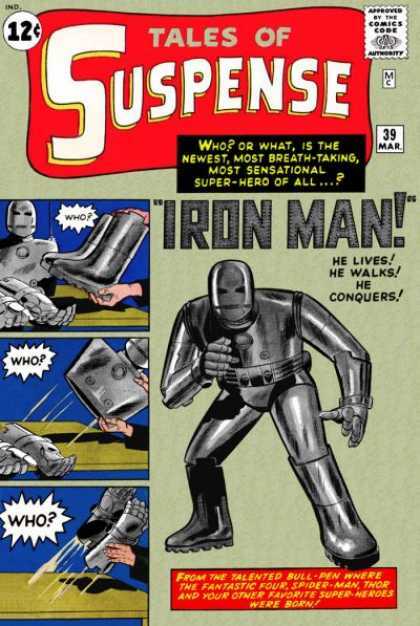 Tales of Suspense #38 – Iron Man debuted in issue #39 (right) of an anthology title by Marvel called Tales of Suspense. The title featured a lot of generic fantasy/sci-fi stories. On the left is the cover right before Iron Man’s debut. After Iron Man appears in issue #39, he would be featured on nearly every cover after that. Iron Man’s debut armor, as you can see, is very bulky and all gray. Then it immediately changes to all gold for his 2nd appearance in issue #40. Iron Man wouldn’t get the first version of his famous red/gold armor until Tales of Suspense #48. 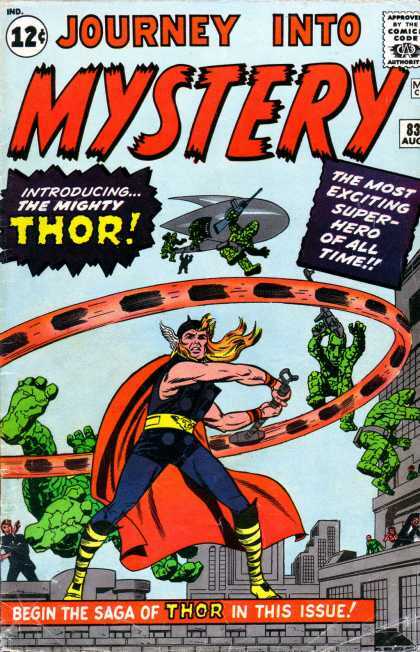 Journey into Mystery #82 – Originally the Marvel Anthology title Journey into Mystery featured weird fantasy/sci-fi/horror tales. 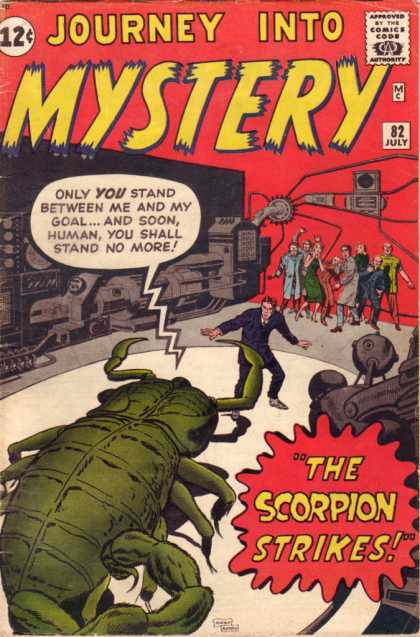 Issue #82 would feature a generic story about giant scorpions. Then, in issue #83, The Mighty Thor debuted and the title would immediately begin exclusively featuring the Norse God’s adventures. 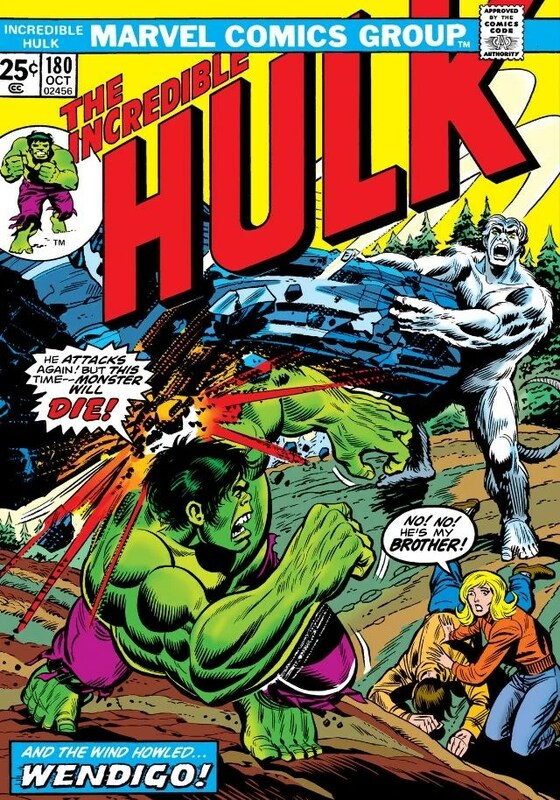 Incredible Hulk #180 – Hulk was in Canada doing a lot of battling with Wendigo and the Canadian military during The Incredible Hulk issue #180 (left). 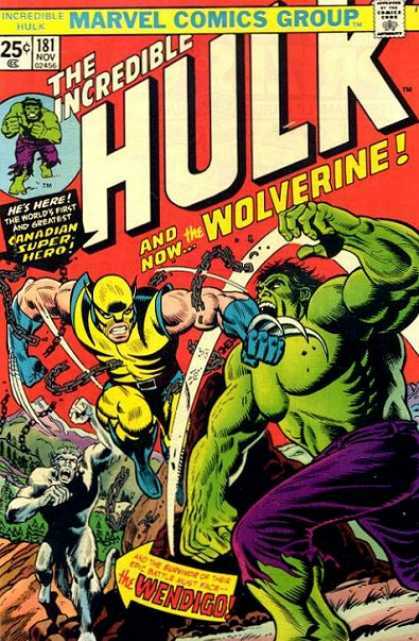 Canada, having prepared for Hulk’s arrival announces “Mobilize – Weapon X!” Then, in a 1 page cameo at the end of the book, we are introduced to The Wolverine who would grace the cover for the next issue, #181 (right). This entry was posted on June 4, 2012 at 8:00 am and is filed under Batman, comic books, pop culture, Superman, The Flash with tags Batman, Cavalcade Comics, comic books, DC Comics, Marvel Comics, nostalgia, pop culture, Superman, The Flash, vintage. You can follow any responses to this entry through the RSS 2.0 feed. You can skip to the end and leave a response. Pinging is currently not allowed. This is a great idea for an article. It’s interesting to see the blissful ignorance on the part of the publishers/creators about what they have created. 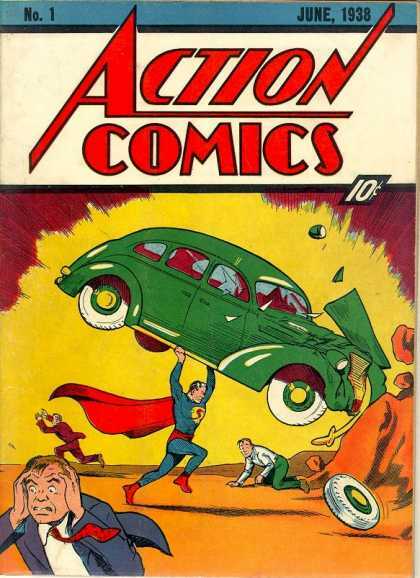 The fact that five issues went by before Superman graced the cover of Action Comics again shows they had no idea what they had just done to pop culture. Although, that Action Comics #2 cover is pretty cool. Thank you, sir. And I agree, that Action Comics #2 cover is really good. I’ve actually been sitting on this article for what feels like 6 months. I hadn’t found the time to fit it in. It was originally going to be a Memorial Day article, but then I posted the wartime superheroes covers. I was going to postpone it again, since I just had the comic cover article last week, but I decided to “let it ride” anyway. I’m very happy with it and couldn’t wait to post it. I have some others I held back that I may use for a part 2. We’ll see. Pax — This is interesting…dare I say, fascinating. Cool post here. Yeah, that was what I was thinking when I was perusing through covers on that cover browser site. I’ve enjoyed your site so I’m nominating you for the Illuminating Blogger Award for informative, illuminating blog content. I know not everyone participates in blog awards but I hope you’ll at least check it out because it’s a great way to discover new blogs, meet new web friends and pay it forward, so to speak. If you’re interested in participating, you can check out the details at my site … http://foodstoriesblog.com/illuminating-blogger-award/ … Hope you’re having a great day! Leo O’Mealia’s cover on Action #2 is fantastic!